This cable modem/router combo provides high-speed shared Internet access to computers, HDTVs, smartphones, tablets, game stations, and other Ethernet and Wi-Fi devices. DOCSIS 3.0 16-Channel Bonding for sixteen times the speed of DOCSIS 2.0. Full-band Capture Digital Tuning for even higher speeds and energy savings. Four Gigabit Ethernet ports plus wireless for a high-speed Internet access. MoCA Filter for improved performance. Provides high-speed shared Internet access to computers, HDTVs, smartphones, tablets, game stations, and other Ethernet and Wi-Fi devices. Installs in minutes using easy Quick Start. Connects all your devices easily to the Internet through Wi-Fi or Ethernet. Fast activation for XFINITY from Comcast, Time Warner Cable, and other popular service providers. Attractive modem/router fits where you want it. (2 1/2" wide by 8 1/2" deep by 9" tall). DOCSIS 3.0 cable modem works with all US cable services. IP6 and IPv4 network addressing for enhanced compatibility. Clean and easy. 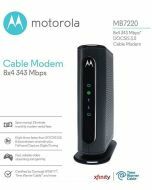 This modem/router combo saves space, reduces wires and power cubes, and provides a single user interface. Wireless Power Boost to the FCC limit for extended speed and range. AnyBeam beamforming at 2.4 GHz and 5.0 GHz focuses the signal on wireless clients to allow enhanced performance and range. Quick setup. Your router comes with its own security password to simplify setup. Typically saves over $100 per year in cable modem rental fees. Check saving for your service provider. Motorola's superior quality and lightning protection protect your investment for years to come.